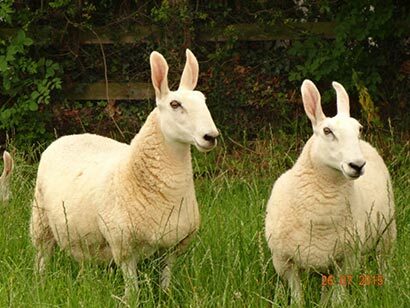 The Doulton Border Leicester Flock started back in 1996 with the purchase of a couple of ewe lambs, Martha and Minnie. The flock grew quite quickly with purchases from dispersal sales and ewe lambs and ewes from the Scottish sales. 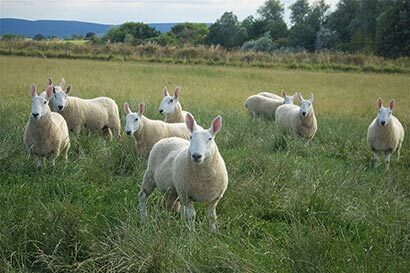 The Border Leicester is now on the RBST “At Risk” list because the numbers of breeding ewes have fallen in latter years. The breed must have between 900 and 1500 breeding ewes to qualify. There are not many Border Leicesters around in the UK now. We are doing our very best to promote the breed and grow the numbers. We are now the biggest flock in the UK with over 300 sheep. The Border Leicester is a beautiful sheep in every respect. 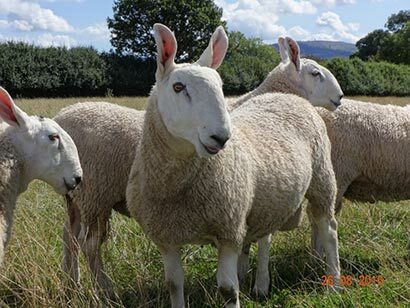 The biggest indigenous sheep in the UK and known as the sheep industry's “Great Improver”, they are primarily used to improve other breeds of sheep, producing superb long, lean breeding ewes. They look so elegant with their big roman noses and fabulous upstanding ears along with a great prescence, they are well liked at shows by both adults and children. Thay have outstanding fleeces. Well crimped, strong long staples and white, they produce a fantastic bouncy yarn with a great handle. Last, but not least, they have wonderful personailities and are very kind. None of our sheep have ever gone for slaughter and never will. We prefer to call them sheep who live to grow old.